For most boaters, engine maintenance falls into two areas: routine (including post-voyage cleaning) and annual (basically, winterizing and spring fit-out) efforts. This article touches on the most important points of both. Routine maintenance can prevent dockside or underway situations that could put your boat in harm’s way and avoid dangerous — or embarrassing — circumstances for you, your passengers, and your boat. 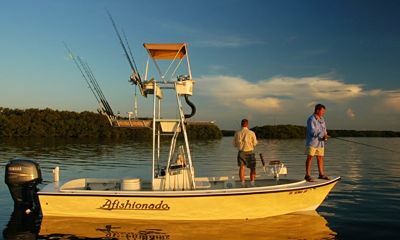 The good news is that with proper care and regular maintenance, modern outboard engines require minimal service, other than routine efforts and minor adjustments. A boat owner can handle most of the routine maintenance for outboard, inboard-outboard, or stern drive vessels without an in-depth knowledge of engines and with inexpensive tools and supplies. Boat owners should thoroughly review the owner’s manual for the engine at least yearly and closely follow instructions for routine and annual maintenance. Doing so will ensure that the engine works as it should and that warranty protections are not jeopardized by faulty or incorrect practices. Prudent boat renters will ask the boat owner about the engine maintenance record and ask if a log is available (see below) before renting or chartering a vessel. Every boating season should start with a tune-up by a professional engine mechanic, either at a dealer or an independent shop. The mechanic should test the spark plugs and warning alarms, run a compression test, perform a lower unit pressure test, check watertight seals and water pump, and inspect the overall condition of the motor. After every outing during the season, flushing the engine is of paramount importance, regardless of whether boating in salt or fresh water. The flushing is even more critical if, while underway, you ran aground or kicked up sand or marine growth. The cardinal rule for flushing is to never run an engine without supplying water to the lower unit. Just seconds of dry running can damage the water pump and other parts. Slip “ear muffs,” (two flexible rubber seals connected by a clamp) onto the lower unit where the water is picked up and attach a garden hose. Start the engine and let the water pump do the rest. Ear muffs are widely available at marine retailers. During the flush, check the water pump to ensure adequate flow by placing a finger through the water stream. It may be warm, but it should not be hot. If the output is hot or weak, debris may be stuck in the outflow tube. Immediately shut off the engine and insert a small piece of wire or similar object into the flow tube and work back and forth. Start the engine again and check the output. After flushing the engine, disconnect the fuel line and allow the engine to totally burn remaining fuel. After the fuel is expended, turn off the ignition. Open the engine cover and check for fuel/water leaks. Any leaks should be immediately repaired. Wipe and lubricate all moving parts, such as the shift and throttle cables, carburetor valves, etc. After completing post-voyage cleaning/flushing, replace the engine cowling. It is good practice to protect the engine with canvas or plastic when stored. Routine maintenance should include a check of fuel system components, including lines, primer bulb, clamps, tanks, vents, and apertures for leaks. An on-board kit with basic tools (screwdrivers, hammer, vise-grips, pliers, etc.) and the equipment listed below provides a boater with the ability to perform routine post-voyage maintenance and affords a chance to get back underway if mechanical, electrical, or other problems occur while on the water. Developing a step-by-step, post-voyage checklist will ensure that you have covered each phase of the cleaning and flushing process every time your engine comes out of the water. Consult the owner’s manual when developing the list to make certain all measures are taken and that efforts do not cause inadvertent damage. Many boaters create a one-page list, covered in plastic and kept on the boat, to be readily available at the end of a voyage. For centuries, mariners have maintained shipboard logs to record events vital to a ship’s operation. Recreational boat owners would do well to follow this custom for engine maintenance, but, of course, on a smaller scale. The few minutes it takes to regularly record maintenance performed and other information serves as a memory jogger for future maintenance needs, saves time and money during annual tune-ups, and provides helpful data. Keeping a maintenance log demonstrates that you are a conscientious boater and the fact that one is available will make your boat much more marketable to renters. Even boaters who have worked on boat engines for years often rely on certified, professional mechanics to perform required annual maintenance. Entrusting motor maintenance to qualified mechanics with high-tech diagnostic tools and in-depth familiarity with the make and model of your engine helps to create some peace of mind when on the water. If the boat engine is under warranty, using your boat dealer’s service department for annual maintenance is the best approach. However, the marketplace is full of independent engine shops that provide services and their work is often accepted for under-warranty equipment. Independent shops may be less expensive. Ask fellow boaters whom they use to perform annual maintenance; visit those shops and observe the work and check mechanic certifications, as well as cleanliness. A busy, active shop can be an indication that the shop performs good work and has no shortage of customers. Keeping your outboard motor running smoothly will make each time on the water a breeze. For choosing an outboard motor, see our article here.